Let me introduce you mural painter artist BLU from Italy. 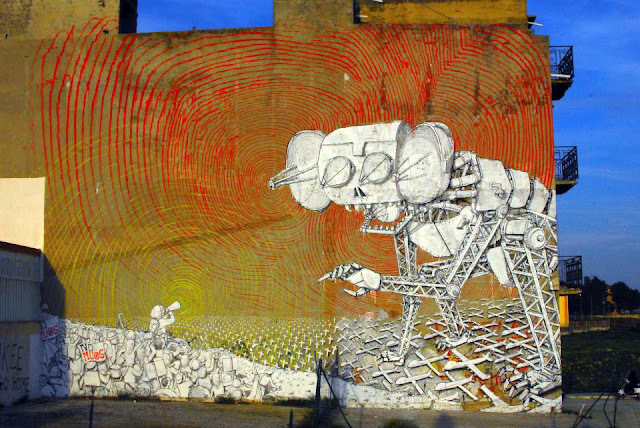 Among other good sources -will come up in this thread-, their works tagged at streetartnews.net also has a wikipage. Not long ago, while surfing the net I have bumped into one of their wall paintings in Rome and after I have -not so easily- found it on GE decided to mark as much as I can. 2nd and 3rd placemark in folder. more full resolution images from blu's sketch note-book, on this and that page. 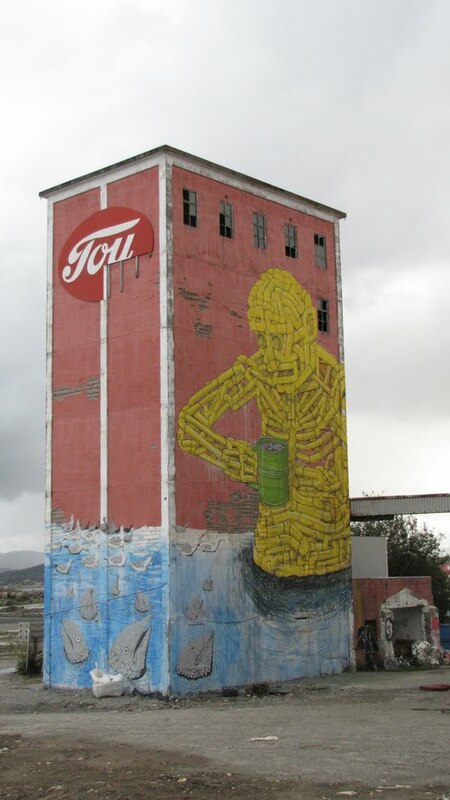 As one can read in BLU's sketch note-book, several other murals can be find in Italy, Poland, Austria, Germany, Norway, Denmark, Slovenia, Serbia, Greece, Spain, Portugal, France, Morocco, Mexico, Bolivia, Argentina, Chile and in the USA. So, well the search is on, also every of your own findings are warmly welcomed in this thread! *Recent stage of updates: 75 murals (places) marked on GE. Attached file in OP updated with 3 more murals in Rome and one from Bologna. 2 more locations from the EU but 3 placemarks. One location without Streetview parity from Munich, and one with Streetview imagery from two time sections. Placemark available by downloading kmz attachment in OP. One from Campobasso, Italy -I think repainted-, one from Buenos Aires, Monserrat somewhat altered, one from Milan, and at last I have found the 2nd in Campobasso, Italy again (in order I found them). The one from Milan has been painted in 2009. so these days looks a bit worn. The latter from Campobasso is situated next to another all-firewall mural by another artist. In palcemark descriptions new LatinAmerican web source appears, where further infos on paintings available. Check GE PhotoLayer for photoreference for some of the artworks in Italy! 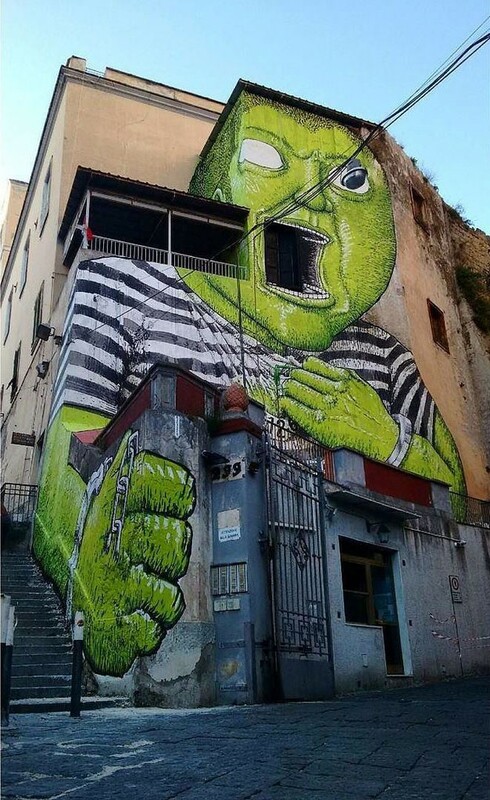 Blu recently spent some time in the city of Napoli in Italy where he just finished working on a brand new piece in the district of Materdei. Painting at the former psychiatric hospital prison known as OPG, the Italian artist created this impressive green giant. Screaming in despair with empty eyes and only identified by a number, the giant is a symbol for all the many nameless faces who passed through this place. 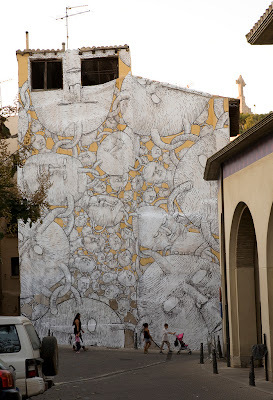 The piece can be found on Via Imbriani, in the heart of one of the historical district of Napoli. This one is marked as 'BLU mural 16' in kmz folder attached to OriginalPost. Italian street art legend BLU ... painted this ... mural for the Hecho en Casa Festival. 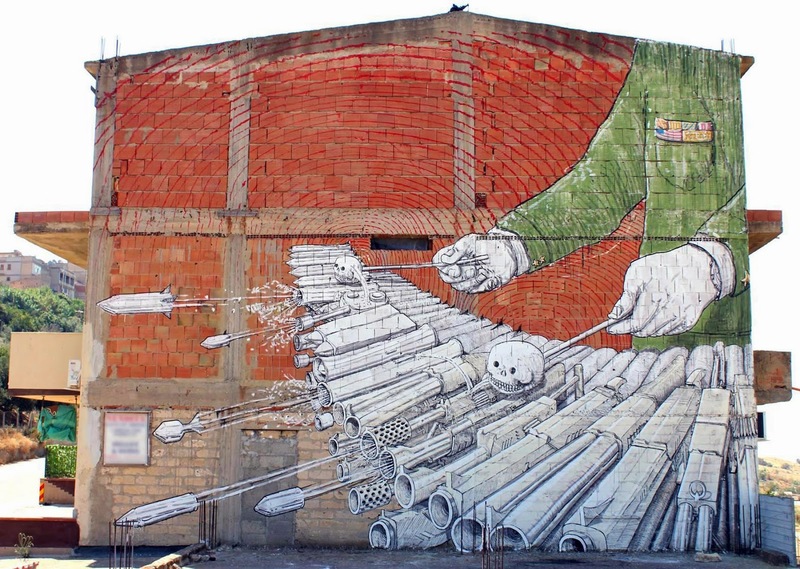 Not unlike the rest of his work, BLU managed to immerse himself in the Chilean reality and create this mural about the Chilean dilemma regarding the construction of HidroAysén, a proposed $8 billion mega-hydroelectric dam project that would provide the country’s central electrical grid with 2,750 megawatts of power over the the next 12 years. According to Policymic the main problem with the HidroAysén plan is that it would build five dams, significantly altering 14,000 acres of the pristine Patagonian region, a diverse ecosystem shared by Chile and Argentina that’s known for its glaciers, islands, mountains, and fjords. In addition to the dams, the project would require the construction of a transmission line spanning almost 1,200 miles — making it the largest in the world — as well as access roads through Andean glaciers. Furthermore, the project could flood the Pascua and Baker Rivers, across which the dams would be built. Flooding could lead to ecological damage in Chile, but the hydroelectric plant could have environmental consequences for the rest of the world, significantly contributing to clime change. The mural intends to depict this exposing the problem in a visual way. An interesting and worrying issue these days. 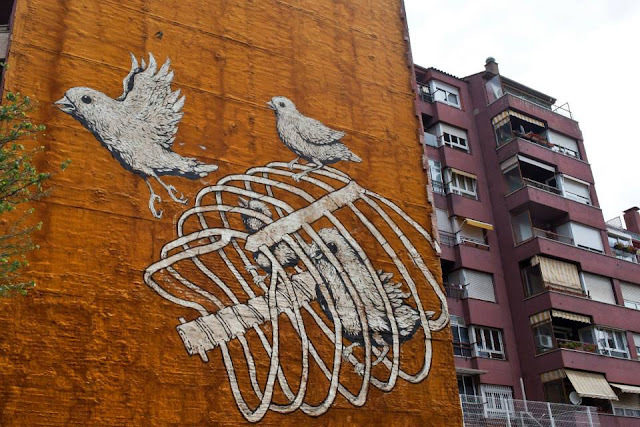 The mural is located at Rivera Norte del Mapocho (between the Patronato and Recoleta neighbourhoods). "In 2010 Blu was invited to Vienna to paint a mural at the Danube River harbour near Albern in the city district of Simmering. First suggested in 1923 as one possibility for the expansion of Vienna's harbour facilities, Albern was selected for realisation by the German Reichsverkehrsministerium (Imperial Ministry for Transport) in 1939, a year after the "Anschluss" of Austria to Nazi Germany. The project was to serve as a logistic node of a future geo- and biopolitical order, designated for the transshipment of grain from the annexed or economically colonized regions of eastern and south-eastern Europe to the heartlands of the German Reich. For the construction of the harbour basin and its five granaries between 1939 and 1942 the Nazi regime employed forced labour. 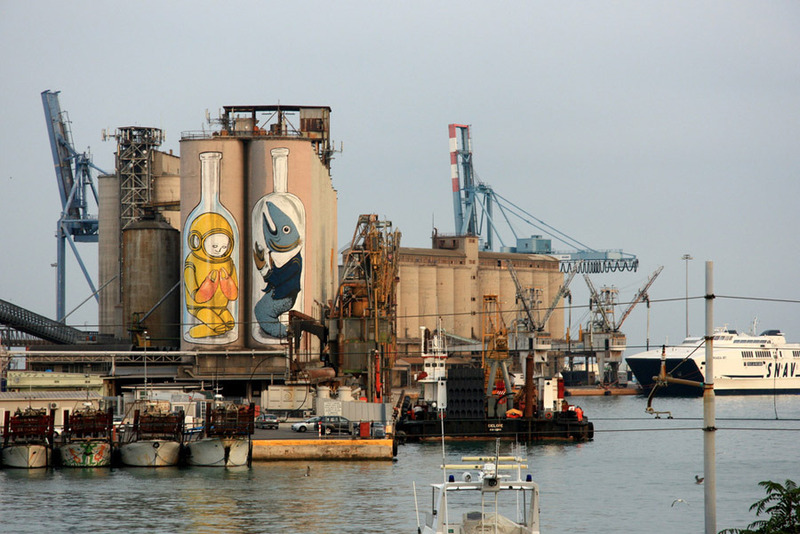 Realized on one of the granaries, Blu's mural called upon the overdue historical and social commemoration of the place's charged history and the unknown fates of the forced labourers who built it. The commissioned piece was destroyed in autumn 2013 in the course of renovation works." Kmz file updated with this one attached to OriginalPost. Not Streetview location, check GE Photo Layer! not best seen in Streetview, but some relevant panoramio shots around. and how L.A. did not. Listed in order of as I have found 28-30. from Greece, Italy and Denmark, year of made: 2011. (first two) and 2008. (Denmark). - All visible on Streetview. Check full pictures instantly by one click on links to the coin-ruins in Greece, to the pasta-sneak-beard man in Italy and to the war-pencil in Denmark. The building has been demolished between 2011-2012, no Streetview sight, still some relevant panoramio shots available next to marker. Both visible on Streetview imagery, also scenes well equipped with relevant GE Photo-layer content. That’s an interesting growing collection. Power to blind walls! Hi BP, glad you like it! I do not know why have I picked just this wall-artist among the several others, those might be better equipped with georeferences in their web-sources. Often, while trying to search on GE surface for buildings without anyhow signed location on sourcepages I think: -whadda hell I am doing? this is such a F&G-faces job!-, so special welcomes around! So new, that has not even dried yet! - No StreetView, no relevant Photo-layer content available on GE, so have put a photo also in placemark's description. In the same breath refreshed all placemarks with photos where no- or not best StreetView view available by this time. 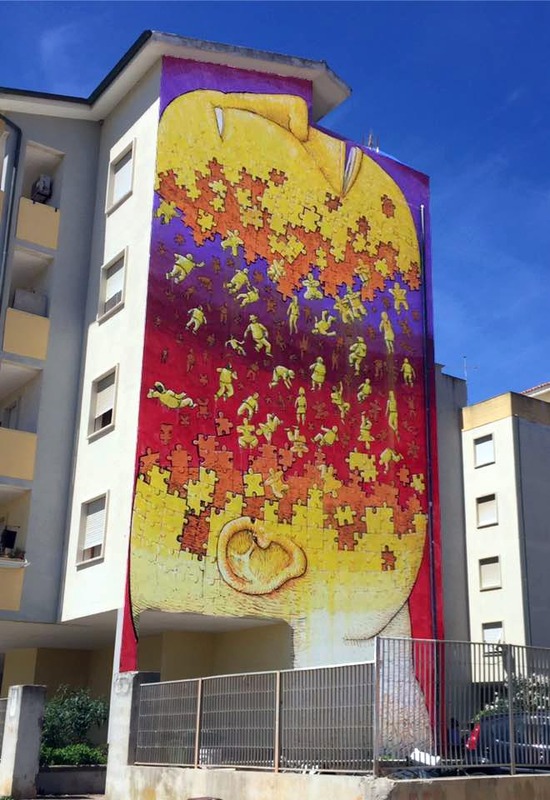 There are humans, animals, reptiles, dinosaurs, red crabs and even fruits – apples and bananas – in the mural that Blu gave to the residents of the Celadina district in Bergamo. All together in a big house with a orange roof, to represent a new way to conceive the popular neighborhoods. At the bottom left, the government painted in a grey tone is isolated as a sign that it does not know how to handle the housing problems. 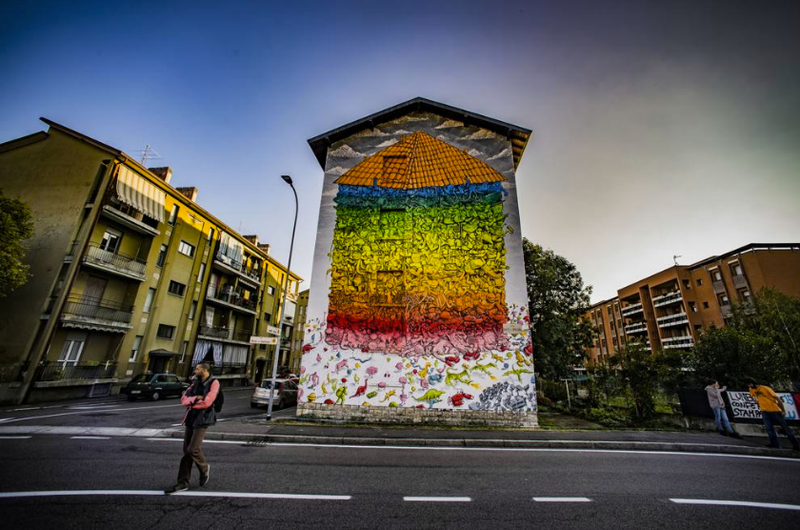 The work was created on a wall of an abandoned building and is painted with different colors, from pink to orange to yellow, red, green and blue of course, facing the street: many people stop and snap a photo, impressed that this neighborhood can be so colorful and vibrant. 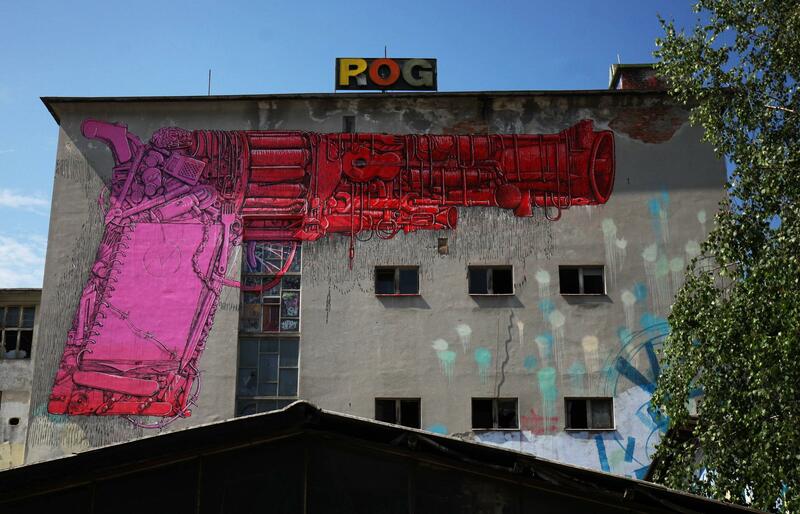 The Rog Factory (Tovarna Rog) is a squat in Ljubljana, Slovenia which has been occupied since 2006. Before the occupation it was an abandoned and decaying former bicycle factory that had stopped operating after the downfall of Yugoslavia. From 2006 till now diverse collectives and individuals found their space in Rog and restored parts of the complex to make a use of it through a self-organised actions with their own resources. There are various art/craft studios, an indoor skate park, a circus practise ground, a social centre, a gym and other infrastructures which are being used by a vast array of people. (solidarity actions, safe spaces for refugee self-organization, etc. ).The complex is located in the city centre, which the municipality of Ljubljana is trying to gentrify along with the rest of the down town area. purposes and for sterile institutionalized art spaces. The municipality notified the community of Rog that they need to leave or they are going to be evicted. After years of hard work, thousands of hours of autonomous initiative, and with no chances to carry on the activities somewhere else, Rog users decided to stay and protect their spaces. Drop your little StreetView chap of GE on Trubarjeva street, N to marker: -However no relevant StreetView or Photo layer content available, still exact wall section of the paint, also cool other graffiti on the streetwalls are visible. The 40. location is about two murals by BLU from 2007. and 2009., Co-work with JR. The iconic murals had been blacked out by the artists for reasons one could have read in The Guardian. Relevant Streetview imagery for the first one and GE Photo-layer content for both are available on GE. By this update I have edited placemark descriptions: all web addresses (links, image sources) embedded into html tags. Walls have been changed since as can be seen on Streetview imagery, therefore added photos to placemark descriptions too. (No. :43) - At last have found this one in Mexico! Two from Niscemi, Sicily with no relevant Streetview or Photo-layer content and one from Ancona with both qualities. An old one from 2007. A bit worn, still can be seen on Streetview imagery, also relevant photo-layer content next to marker. Well, with this two I have reached the psychological half-hundred placemarks in this collection, what I frankly have not thought a month ago, when the search started. Thanks for the attention so far and stay tuned! These both are signed with #2 while the two previous finds in Berlin and Valencia got their #1 in folder.